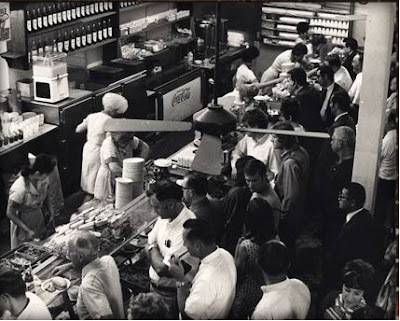 We embarked on another adventure in L.A. We went to a famous Cafeteria/ Deli called Philippe’s. It has been around for over 100 years. It is known for it's French Dipped Sandwiches and 70 cent lemonade. On the drive down there, Nathan took us on the craziest road in Echo Park. The road, no joke, had the incline of a rollercoaster (if not more), and when at the pinnacle, it is as if you are going over a clif because you cannot see the road over the nose of your car the descent is soo steep! It is crazy, and even crazier they’re a three of these hills in a row! After enjoying our French Dips, we made out way over to the L.A. Temple. We stopped at the 7-11 across the street and got HOT chocolate. After walking around for a while and taking some pictures, we made our way back home. We came home to watch "Mickey's Christmas Carol." Our yearly picture. We have taken one here all 3 Christmas' we have been together. We lovw Phillipe's. It's an old Connelly family favorite. Sean and I took a day trip down there too and enjoyed the goodness. We also bought the mustard and brought it home to Dad. Good times--Good Food. You guys are so cute. I love that you are always going on adventures. I want to go to that cafe next time we go home!